April Class and Component prices all moved down vs. the prior month. The Class III price dropped to $15.13/cwt., the lowest price in 2017. Milk protein was down the most, falling to $1.70/lb., which was caused by a 3.8% drop in cheese prices. Butter prices also fell to a new low for 2017 at $2.17/lb. 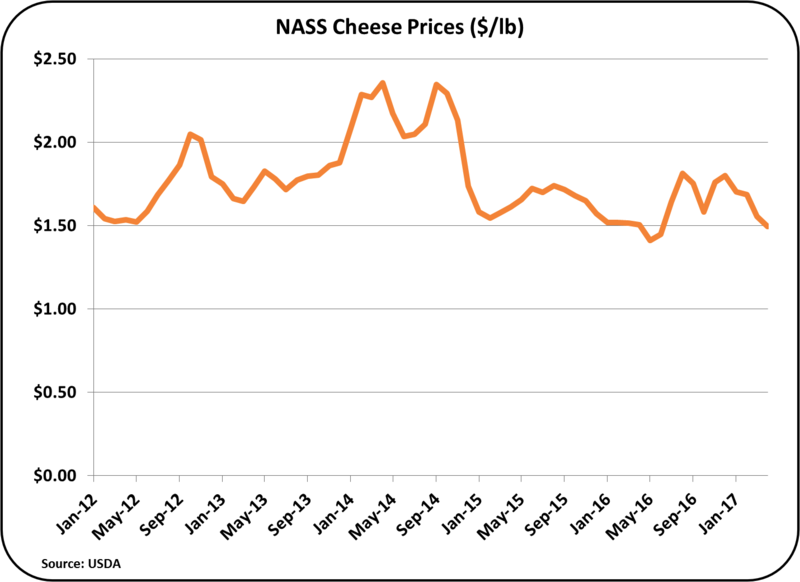 Cheese prices skimmed along at the $1.50/lb., which is the lower level of pricing for the last six years. In the prior post, the increase in consumption of cheese was reported to be about 3.5% for 2015 and 2016. This is well above the historical increases in cheese consumption. The lower prices in 2015 and 2016 have no doubt contributed to the increased consumption. It appears that 2017 is following a similar path. If this continues, their will be a need increased amounts of Class III milk. The most important characteristics for Class III milk are high protein and low somatic cell counts. 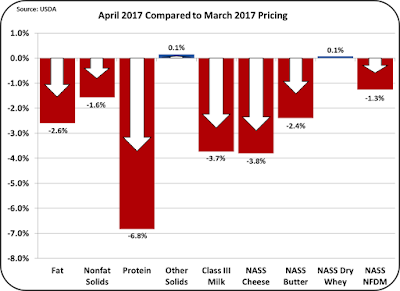 Nonfat dry milk pricing is following a similar pattern with an April price of $.84/lb., also a low for 2017. Nonfat dry milk is the basis for pricing Class IV milk. The prices of Class III and IV milk really set the level for all milk pricing. 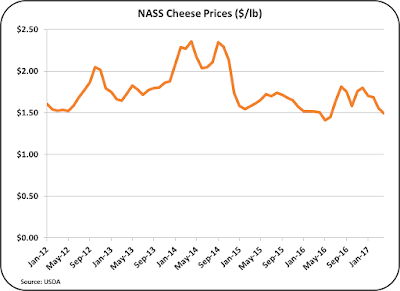 The Class III skim price is determined primarily by the cheese price (see prior post) and the Class IV skim milk price is determined solely by the price of nonfat dry milk. In turn, the Class I price is based on the higher of the Class III or Class IV price and the the Class II price is based solely on the Class IV price. The higher price between Class III and Class IV, has favored Class III since the start of 2016. The Class IV price was lower than the Class III price in every month of 2016. 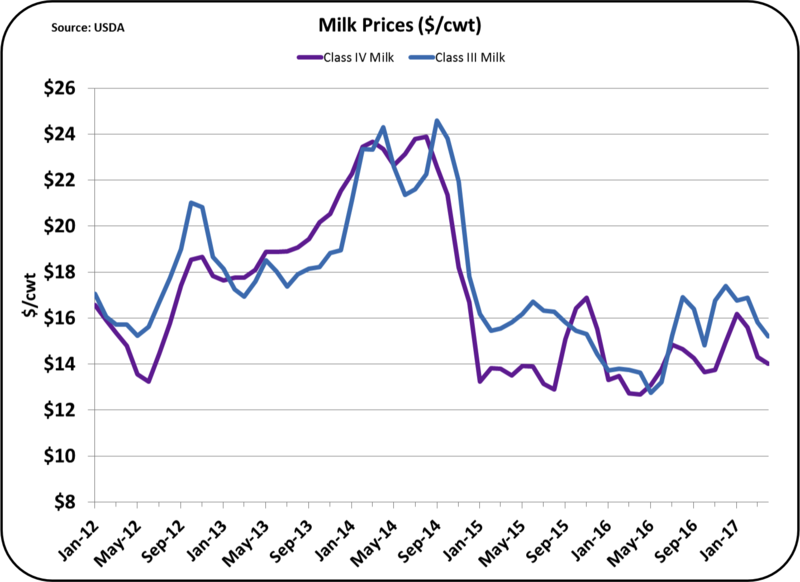 Class IV milk started 2017 with a higher price, but the price for the last three months has fallen back to 2016 levels. 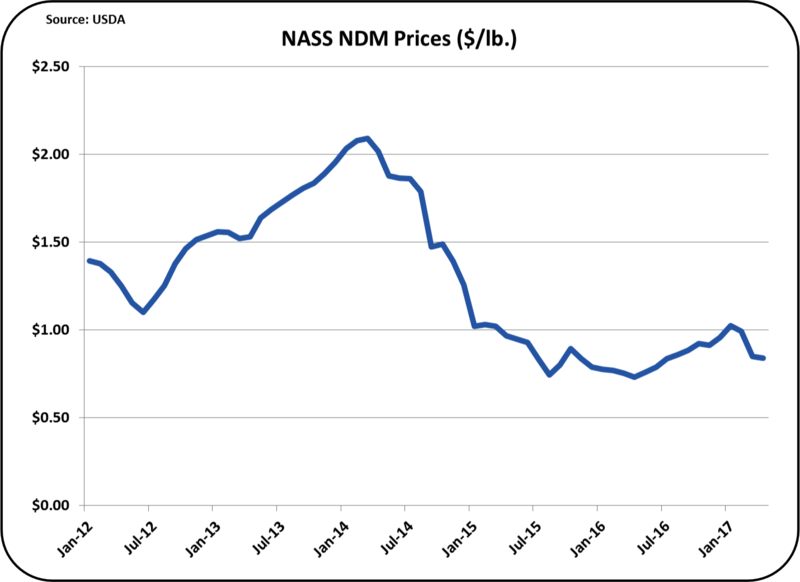 The international price of nonfat dry milk/skimmed milk powder dictates the domestic price and the international price has been declining in 2017. 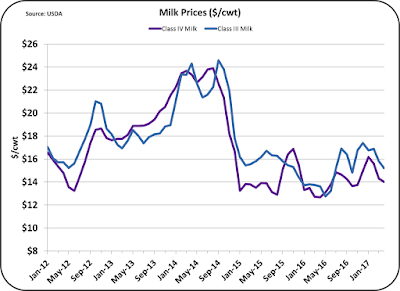 At least for the near future, Class III pricing will probably remain above Class IV pricing and therefore it will be the basis for pricing Class I milk. This in turn means that the uniform milk price will be very dependent on the price of cheese. More on cheese pricing is covered below. That brings us to butter and butterfat. The price of butter is still extremely high by historical standards. At $2.12/lb. in April, butter remains high priced, but butter from other countries has increased in price during the last half of 2016, to meet U.S. prices. 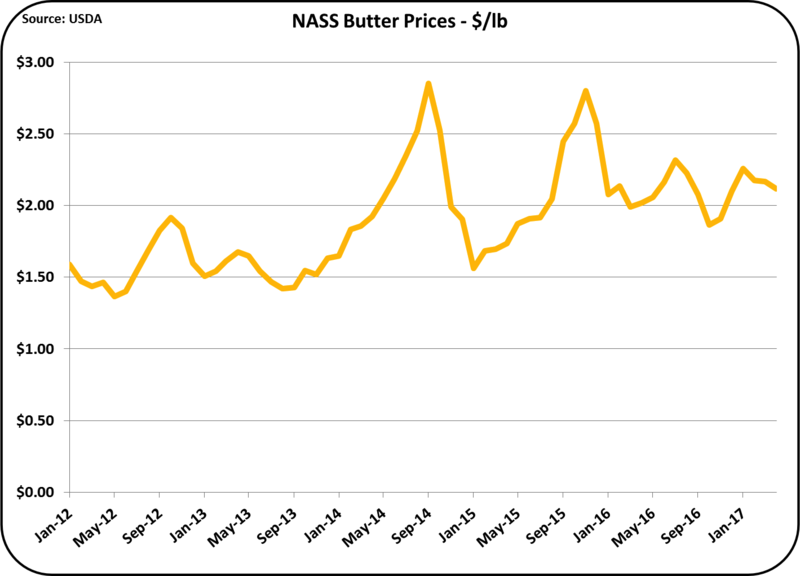 Therefore, there is little reason to expect a lower butter price in the near future. 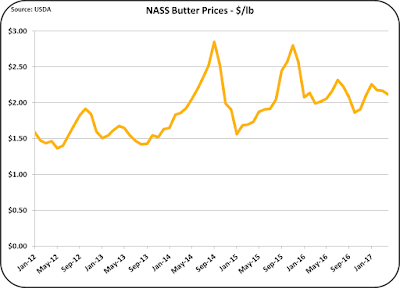 As covered in the prior post, per capita consumption of butter is increasing, keeping pressure on inventories. 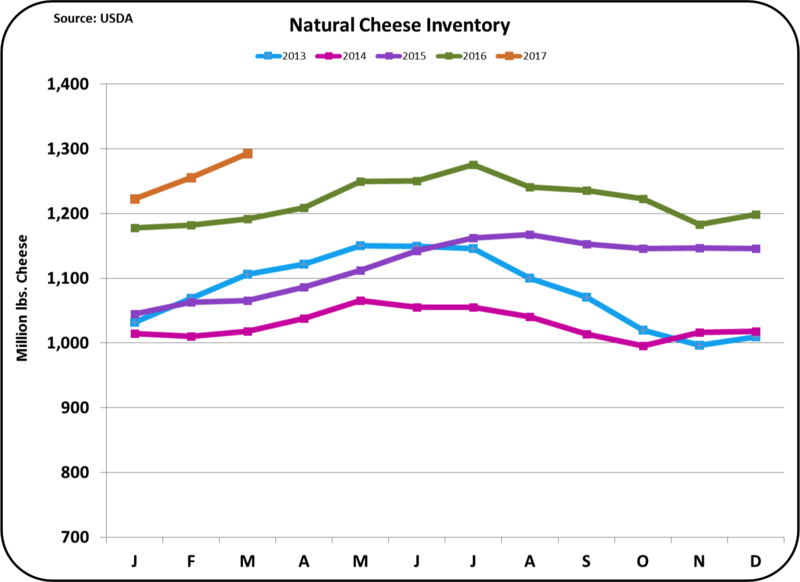 The only really high dairy inventory is cheese. Inventories of cheese are growing faster than consumption or production. 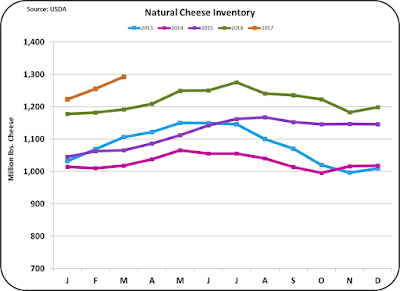 Cheese inventories have become a parking place for excess milk production. As long as the inventories are high, prices will remain low. 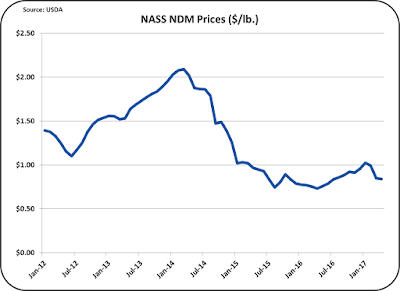 The futures market is forecasting some prices increases for all dairy products. As a result, the Class III futures prices is expected to increase by maybe 10% by the end of the year. Exports and imports will be covered in the next blog. There has been some progress in increasing exports. The most important dairy export, cheese, has seen increases but even with these increases, cheese exports are far below 2014 and 2015 levels. One of the significant variables that could change 2017 milk prices is the possible change to bring California into the Federal Order system. During the month of May, there will be another post to this blog on the status of this change.